We arrive at the Lomac headquarters of the Culpo F.lli group, crossing the stupendous hills of the province of Vicenza. Smiling faces, handshakes: they make us feel right at home. 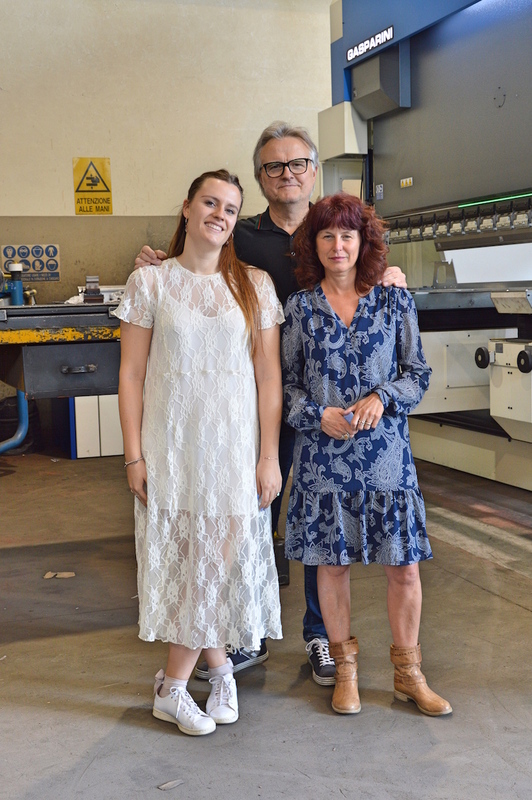 We sit in the office with the owner Franco, with his children Chiara and Marco, and with Loreta, and we have them tell us how this company was born. “The business started in my mother’s garage in the 70s, we were employees and worked in our free time. At that time it was still possible“, explains Franco. “We made gates, railings, doors, carpentry. Then we had to move to a small workshop, then to another larger one, and since 1986 we have been here. Our main customers are manufacturers of agricultural machinery, dryers, and car washes. They are loyal partners, with whom we have been cooperating for 30 years“. Yet, a company must always be in search of new opportunities, to grow and have a wide range of customers. In a competitive and mature sector such as contract manufacturing, it is important to be distinctive. “It’s hard to get something out of place, we pay a lot of attention to quality: customers know that they don’t have any nasty surprises with us“, adds Marco. Born in 1991, it is one of the new generations in the company. Loreta, a long-standing figure at Culpo, explains their strategy better: “With the crisis we have focused on quality and service, carving out a space with complex processes where there is less competition and your professionalism can be affirmed. We also stand out by focusing on what the new machines bought allow us to do, with the 6-metre bending machine. Many competitors stop at 3-4 meters“. 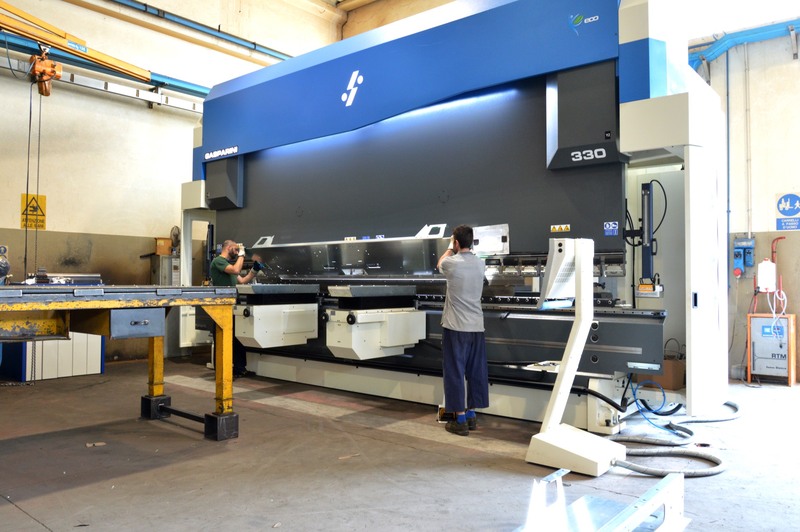 Lomac has just purchased a new laser cutting system and an X-Press Next press brake of 330 tons on 6 meters, with electric sheet lifters, increased stroke and daylight, 7 axes, hydraulic clamping for the dies and AirSlide pneumatic punch clamping. “Even if we haven’t advertised or spread the voice yet, we’ve already started to receive requests for pieces of 5 meters and more“, says Marco. “Our sheet metal supplier has even contacted us with customers who were looking for subcontractors with these capacities for 6 metres“. This shows once again how it is possible to gain a foothold in the market by focusing on cutting-edge machinery with different characteristics from the average. Thanks also to these new machines, Lomac is living a positive period of growth and excellent professional satisfaction. But it wasn’t always like that: “For us, the period of crisis was really a bad moment. The loss of a brother, the drop in work, the unemployment benefit have made us go through difficult months“, Franco tells us. Once again, commitment and determination have allowed us to get through the storm. “We held up and managed to overcome the crisis and now it’s going well“. 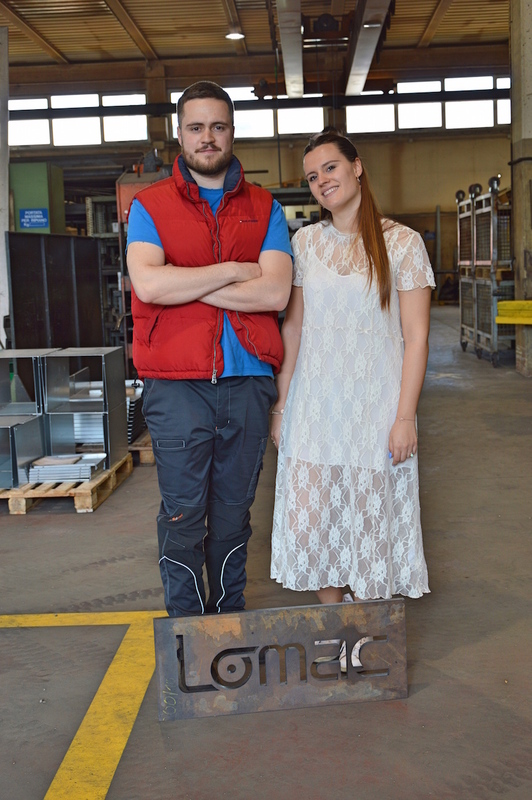 The Lomac team is composed of the owner Franco, a laser operator, two press brake operators, five welders, Loreta and Chiara in accounting, and Marco. “As soon as I arrived I only unloaded the laser, then I started doing other things in welding and bending. I also took CAD training courses“, says Marco. “The customer gives you the drawing but it must always be checked before sending it into production. Before accepting an order, we examine the part in depth, and if we see that it is not feasible or we can not guarantee the delivery time we report it immediately. We prefer not to take a job rather than put the customer in trouble“. While Marco is talking, Franco nods smiling. For him, who left his job as an employee at 18 to bet on Culpo F.lli first and then on Lomac, seeing his children take their first steps in the company is a great satisfaction. But the integration of the new generations is a long process. “This is not a job, it is an art, it takes experience“, says Marco. Marco has been at Lomac since 2012 and at the company he deals with various things, both in the workshop and in the technical office. The other new entry is Chiara: “I’m here since 2016 in accounting, I follow the financial side and communication. We are rebuilding the site, we opened the company’s Facebook page with new photos and videos. My goal is to become an expert like Loreta, learning as much as possible from her“. Marco echoes: “My goal is to grow even more and carry on what my father and uncle started. We’ll do it by keeping up with the times, because if you stay behind you’re out. Changing two such machines was almost indispensable“. There are many companies born in the ’70s that face the delicate issue of generational change and the integration of young people in companies, especially in small family businesses typical of the Northeast of Italy. What do Chiara and Marco recommend to young people who, like them, would like to enter this sector? What are they living and what is their experience? “We are lucky enough to work in a family environment, we try to learn as much as possible; we have a closer relationship that allows us to go into more detail in many respects“, Chiara replied. Also for Marco the key is to listen: “I’m not working the classic 8 hours, I’m always here and whatever my father says I absorb everything. My advice is to listen to and collect all the wealth of experience. One who follows a parent should not think that when the siren sounds they go home. It takes more commitment and not thinking that you have learned everything. You also need to make mistakes sometimes: you learn from your mistakes. Training is also important, but some secrets can only be learned in front of the machine. When we change machines we always take lessons to learn how to use them. I always do refresher courses, even welders do welding licences because it is often the customers who ask for the certifications“. We also ask Franco what he recommends to those who work in the sector, both as a new company and as a second generation: “First of all it takes a lot of passion in the job. You must love fabrication, otherwise don’t even start, as for many jobs after all. A turner doesn’t necessarily like to be a welder. If you want to start a new company, I wish you all the best!“, he exclaims with a touch of irony. “Especially in Italy, with all this bureaucracy. We are now in it and we understand how it works, but for one that starts from scratch is difficult. To start without making a hole in the water, you need capable people who can work, and wide shoulders from the financial point of view. Then it takes entrepreneurial ability, and not thinking of opening a business just to make money, buy a beautiful car or a villa“. As is our custom, we also want to talk about the human side of people who are part of a company. Who is Franco Culpo? “A simple person who went to middle school, who at 14 started working. I now am 60 and I am still working!“, he explains laughing. “I tried in my own small way and it went well, now I’m happy because I have my children here at the company. In addition to my work I like cycling, it’s my great passion even if I don’t have much time to dedicate to it by now“. Loreta Marcazzan instead had a different path: “I attended the university in Economics and Commerce, at the beginning I was a teacher of mathematics in Accounting school, then in 1994 I arrived here and I like it more than teaching. I’m a strong person with a strong character, I’m not sporty but I like to read and travel. I have a daughter and a puppy, and I consider myself a lucky person. I am a person who adapts very well to the various situations and who sees the glass half full“. Even more different are the stories of the two young people. “I was born in 1996, I studied Accounting in high school, then I arrived here and I feel very comfortable“, Chiara tells us. “In addition to my work I do gym and dance, and I did theatre and swimming. I’ve always been sporty and I like to travel, sometimes Loreta and I go away together“. Marco has a different character and role: “I consider myself a lucky guy, I’ve had everything but I haven’t been spoiled. I was born in ’91 and I am a surveyor; after my high school I immediately arrived here, also because they needed a hand. Here began my journey from the bottom and I’m working hard. I’ve always been a sportsman, I’ve tried and practiced a lot of disciplines. I’m a quiet and cheerful guy; I like to deal with people in a constructive way. I tend to get a bit nervous in stressful situations. When I can’t get to something right away I get angry with myself, I expect a lot from myself“. Loreta is proud of the two, and sees them as part of the company’s future: “They have both made a lot of progress, they put their passion into what they do and they promise well“, she explains. “We bought the new machines for this reason too, because we know that they will be using them in the next few years“. Marco, who is in direct contact with the production aspect, shares Loreta’s opinion: “These two machines, in my opinion, were the first step to grow. To be competitive and be able to have better margins. Technologically, the bending machines have made giant steps forward in recent years: there is an abyss between our old press brake and the new one“. 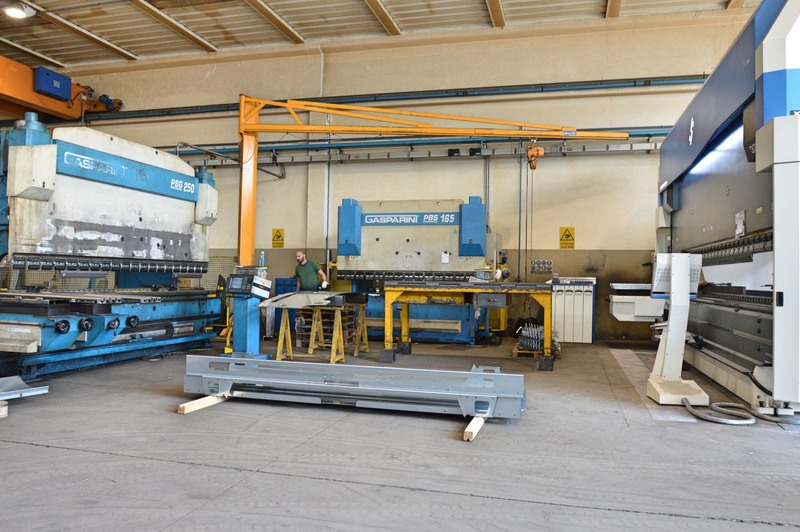 “We have two other Gasparini press brakes and a Gasparini shear, and we’ve always been happy“, Franco reveals. “Machines sooner or later stop as good as they are, and always stop when there is an emergency, so quick intervention is important. 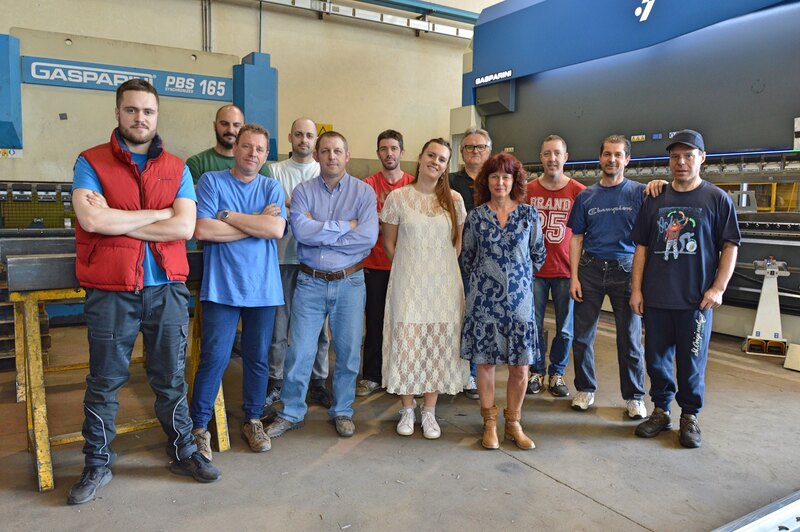 When there was some problem in a maximum of 24 hours Gasparini technicians came to solve“. Marco also agrees: “I don’t know if there are any better products on the market than Gasparini from this point of view. We always had a good experience, why change? At the end of the day, it’s the same relationship that customers have with us“. It was an interesting and fun morning: we greet the whole Lomac team, with the confidence that we will soon be back to visit them.